Stay at Home-ista: Spray Painting and Stenciling the Guest Room Nightstand (Blogging Without Borders) and a giveaway! Spray Painting and Stenciling the Guest Room Nightstand (Blogging Without Borders) and a giveaway! When we last left off, I had gone on a polka dot spree on the feature wall in the guest room. I'm in love with the fun confetti wall treatment that I created with vinyl decal polka dots. Now it was time to tackle the nightstand. Just like when I spray painted my daughter's nightstand, I did the same here, painting the body white, and "dipping" the feet green. Close up of the feet. Then I was approached by Cutting Edge Stencils. They offered me a free stencil (yes, please, where do I sign?) and the chance to host a giveaway for one stencil up to $50 in value (with free shipping). So it's a win-win. Win for me, I get to try something I've never done before, and win for you, my readers, since you have the chance to get yourself some awesome stuff. I selected the Aladdin small craft stencil, since I knew I wasn't prepared enough to stencil an entire wall, especially after all that work two weeks ago. Having never stenciled before, I was super happy to find the Cutting Edge Stencil YouTube How-To Video. Let's just say I needed a bit of a visual before I could get right to work. They also have a blog, which offers more tips and tricks and ideas for projects. I dug out some green acrylic craft paint, perfect for stenciling since you can just clean up any mistakes with water. Then I used spary adhesive on the back of the stencil before adhereing it to the top of my nightstand. First I tries using a stenciling brush, but I quickly realized that would take me all day. So I switched to a small foam roller and boy, did it get done quickly. Like so fast that the kids (who were watching me) didn't even have time to start whining! After I let it dry, I sprayed it with a low VOC top-coat so that the pretty part won't chip off. And in the room it looks even better. I let me kids take these pictures, so they are clearly from a three year old's perspective. And there is a baby block in the pink basket if you look closely. Ok, so now that you've sen what I did, enter the Rafflecopter giveaway below for your chance to win a stencil from Cutting Edge Stencils (sorry, only US residents)! Please check out my lovely friends who are also challenging themselves to do something new and different. this came out so cute! love the feet! love the pics, too- the kids did great! I would stencil a little magazine table I want to refinish! I need more pattern in my house. I think I would stencil a wall! I must confess, I'm a little jealous! I have about 100 things I want to stencil, and I've entered every Cutting Edge giveaway in the world, but to no avail. But I have to let my envy subside, because I am loving your guest room, and that nightstand turned out so cute. Nice job! I'm going to try again with your giveaway, and if I win (fingers and toes crossed!) I'm also going to do a nightstand. I've never used a stencil. I love how this project turned out! I have a small wooden table I would love to stencil! I've been wanting to stencil the top of a nightstand. It came out adorable! Love the light hearted feel you are adding to the guest room. Aren't stencils amazing! The first time I used one I couldn't believe the "bang for the buck" and so quickly. I'd love to win me one because I may stencil the top of my dining room table when I paint it :) And it was so fun to see photos of the room from your kid's perspective. Great job on the nightstand! I need to stencil the top of my daughter's nightstand, too! That whole room is adorable! I love it. I would stencil a statement wall in my bedroom and use in when I re-do my dresser in a similar way to what you did. Thanks for the giveaway! Great job on the nightstand, I love it. And you make it look easy! I hope, if I win the giveaway the nightstand sitting in my basement waiting for paint comes out as well. Love the dipped feet! I've got my stencils ready to roll - just gotta find the time to do it now! This looks so sweet :) Great job on the stenciling!! How cool! I love this!! I would use the Zagora stencil to stencil some curtains. I love the bedroom wall! So pretty. I really want to do something similar in the kids bath. I think the polka dots done simply with alternating colors makes for a great visual impact that's not childish. Beautiful job using stencils. I'd like to stencil a wall in our bedroom. Love the stencil! This room is going to be so cute! Very cool and very pretty! I've not stenciled before... maybe I should give it a whirl! What an easy way to transform a piece of furniture. Love the new look. That looks like a whole new nightstand. I love the stencil on top and the contrasting feet. If it was pink, I think my kids would fight over who got to use it! That nightstand is adorable - and seeing it made me realize that's exactly what I want to do to the new (to her) desk going into our 7 year old's room I'm in the process of redoing. Thanks for the inspiration and the giveaway! I would like to try a stencil on my kitchen table. I would love to stencil my daughters dresser that I just repainted. It needs a little help! That came out great! I would stencil a dresser front! I would stencil my kitchen table...believe me it needs it. Oh and quick question, do you need to let the stencil adhesive dry a little before sticking it to whatever you're painting? I just bought a very sad looking cupboard and I have been looking for the right stencil - this one would look totally awesome! I would stencil my bathroom walls. I love that look! I probably would stencil a wall in my dining room! I would stencil my garden potting house!!! I would stencil an accent wall in my living room. You know I love this. Thank you so much for linking up to our party!! But I've been a bad blog friend so I'm sorry. And I love how the table turned out. And the stenciling is the perfect touch! I just subscribed to your blog. I grew up in SF bay area, and now live in Vancouver B.C. I'm renovatng a 1945 year old house, beach cottage style. I know I have my work cut out for me, so your tips are really helpful! 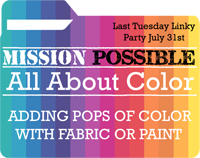 Jessica - glad you linked up this beauty to our Color party!! That is just awesome! And, I love that you had the little one take the photo! Precious!